Tettegouche State Park is home to some wonderful hiking trails and a favorite of mine is the trail to Shovel Point. 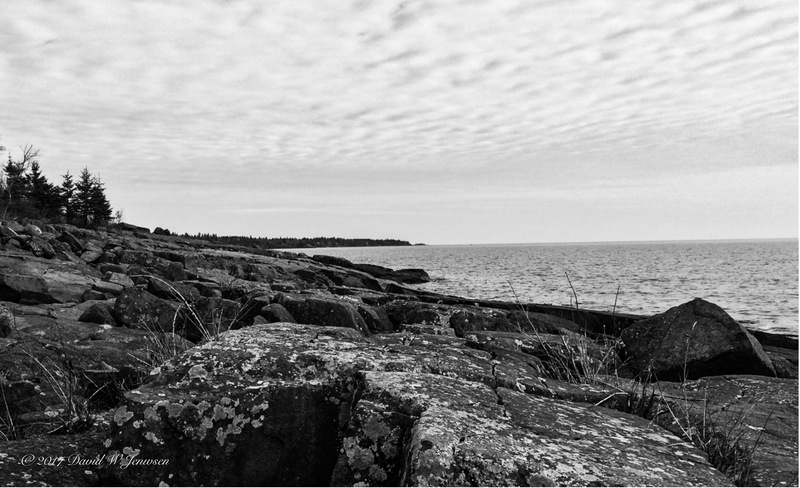 It does require climbing some stairs, but the hiker will be rewarded with wide open vistas of Lake Superior and the north shore. For the fourth year in a row, I had made a plan to take part in the “Opt Outside” movement started by REI. It has grown over the years to include many other businesses. In Minnesota, all the state parks are open to the public for free on the Friday after Thanksgiving. However, as the day drew nearer, I became concerned about the weather due to the extended forecast calling for freezing rain on Friday and I had hoped to travel up the north shore of Lake Superior to visit Cascade River State Park. In the event travel wasn’t possible on Friday, I chose to take my trip on the day before Thanksgiving and opted to only go as far as Temperance River State Park. I also made stops at Gooseberry Falls State Park and Tettegouche State Park. Here are a few memories from the last three days. If you stare at the black & white image for awhile, it morphs in to all kinds of strange things. Another sunrise with a lot less sun, but plenty of ice. A sky blanketed in clouds, a hazy glow from the sun. Ice everywhere, rocks holding fast to their formation, silence dominates the scene. Even now, viewing the image, I remember that silence, being immersed in the moment. Quiet, quiet, more quiet. Nice view of Lake Superior, large yard, needs some updating. Perfect for the do it yourself type.